Colorado Mom Heather Surovik was eight months pregnant when a drunk driver hit her car. 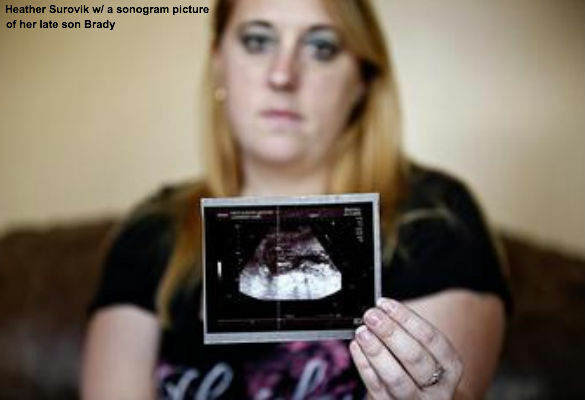 She was seriously injured, her unborn son Brady was killed. Yet according to Colorado law, Brady’s killer, drunk driving repeat offender Gary Sheats, was not guilty of murdering Brady. Sheats was allowed to plead guilty to driving under the influence and vehicular assault because under Colorado law Brady was not a person. As Heather Surovik so poignantly put it: "He was considered part of my injuries—a loss of a pregnancy." Abigail Pesta of NBC News reports Surovik’s experience is “at the heart of a heated debate that will bring Colorado voters to the polls this November to decide on a measure known as the Brady Amendment, which would change the criminal code to redefine "person" and "child" to include "unborn children." The measure made the state ballot after activists collected enough signatures to put it there. Also called Amendment 67, the measure is backed by "personhood" proponents, who believe life begins at conception. Personhood measures have made the state ballot twice before in Colorado, led by the efforts of Denver-based nonprofit Personhood USA, but did not pass. Amendment 67 is different. "There were two victims here," Surovik says. "My son wasn't a loss of a pregnancy—he was a person, an eight-pound boy." She said the law is a bid for justice for "both the mother and unborn child." Opponents of Surovik’s proposed amendment, including Planned Parenthood and the Center for Reproductive Rights, argue that the measure could have wide-ranging effects on women's reproductive rights, extending beyond abortion, a claim Heather Surovik and her supporters vehemently dispute. "Opponents have long used scare tactics like these," said Jennifer Mason, communications director of Personhood USA told NBC’s Abigail Pesta. "Recognizing that there are two victims in cases like Heather's cannot ban in-vitro fertilization, nor can it ban contraception. Recognizing that Brady is a person is a threat the abortion industry, who profits from the idea that babies like Brady are not people. Brady was a person when he was newly conceived, when he was at eight weeks gestation, 18 weeks gestation and eight months gestation. Brady was fully human, fully alive, and Colorado law should have ensured justice for Heather and Brady." Click this link to watch Heather Surovik’s interview with Mike Huckabee. Submitted by ronnine on Wed, 02/19/2014 - 01:59. Historians suggest that while Hitler and Stalin held views which were 180 degrees apart, their tactics were identical. Apparently the same thing is true of the abortion people and the NRA. Neither will give an inch, no matter how nonsensical!